DAVV Indore Recruitment 2013 | dauniv.ac.in Apply Online 172 Vacancies : 1. 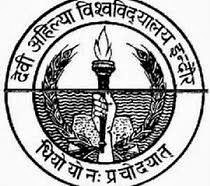 Devi Ahilya Vishwavidyalaya, Indore is recruiting various candidates for filling up 172 vacancies in various positions. All the candidates who are eligible and interested can apply by sending the application in prescribed format on or before 21st November 2013. Guys you can find the application form on the official website dauniv.ac.in. Candidates must possess Degree / Diploma in relevant trade from recognized university and have relevant experience. Based on the performance of the candidate in interview, selection of a candidate will be done. 4. Application fee: Applicants must pay the fee i.e, in the form of DD which is drawn in favour of Registrar, Devi Ahilya Vishwavidyalaya, Indore, payable at Indore. Open the official website of Devi Ahilya Vishwavidyalaya i.e, dauniv.ac.in and download the application form format. 7. Candidates join us on Facebook for latest news and updates about Devi Ahilya Vishwavidyalaya results 2013. Guys subscribe us for free email alerts and bookmark our page for future updates.